The Lady Reds are off to a 4-0 start in the preseason, highlighted by a 64-25 win at defending 4A state champion Salem Hills last Friday. 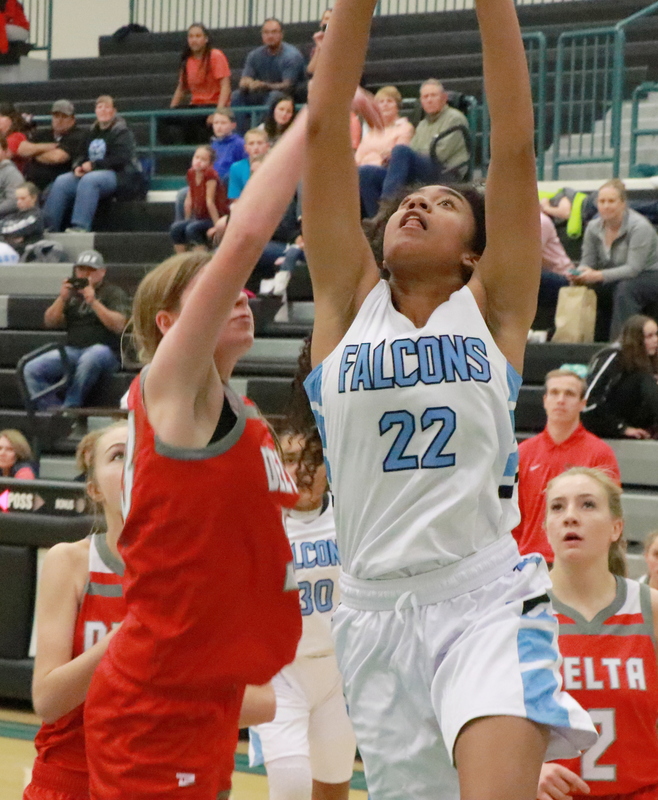 The SkyHawks had knocked Cedar out of last year’s playoffs with a 68-58 quarterfinal win, but this time around, the Lady Reds jumped out to a 23-7 lead in the first quarter and rolled to the easy victory. Junior guard Mayci Torgerson led Cedar with 18 points, while sophomore center Samantha Johnston added 17, including five 3-pointers. Both players are new to this year’s roster, having moved to Cedar City during the off-season. Cedar’s top scorer from last year, junior guard Japrix Weaver, is still not yet fully recovered from the knee injury she suffered at the end of the 2017-18 season but is expected to return to action on the court soon. 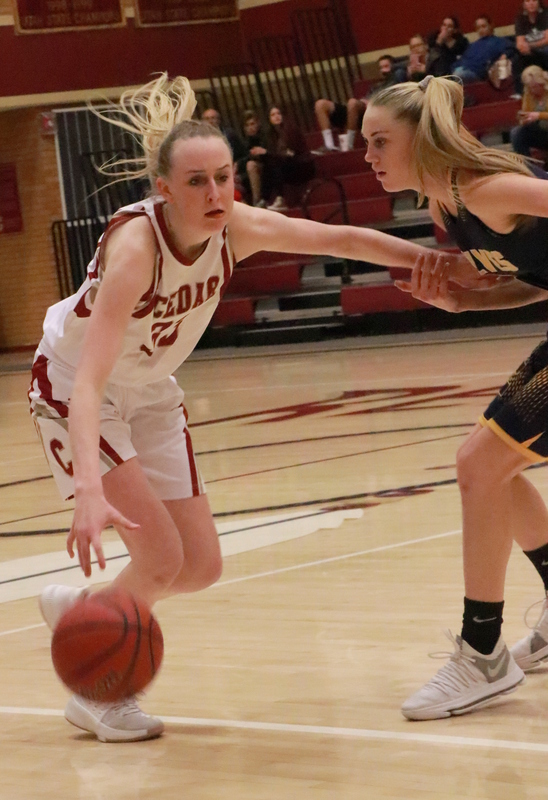 Cedar’s other preseason wins include a 50-47 win at Beaver on Nov. 29, a 73-40 home victory over Enterprise on Dec. 5 and a 47-30 at Lehi last Saturday, during which Denim Henkel poured in 21 points to lead the Lady Reds. Cedar’s only game this week is a home contest against Timpanogos at 7 p.m. Thursday. The Lady Reds will open the regular season Tuesday, Dec. 18, at Dixie, also at 7 p.m. The Hurricane Lady Tigers are 2-3 in preseason play, getting wins over Juan Diego and Box Elder during the three-day Desert Hills Holiday Classic invitational tournament Nov. 29-Dec. 1. Hurricane jumped out to a 19-4 lead in the Juan Diego game and coasted to a 60-37 victory. Guard Madi Hirschi scored 21 points to lead the Tigers. The Box Elder game was closer, but Hurricane pulled out a 52-49 win. The night before, the Tigers fell to the Logan Grizzlies, 50-30, also at Desert Hills. Last Tuesday, Dec. 4, Hurricane lost at Provo, 72-59, then fell at home on Saturday to Uintah in overtime, 69-65. Hirschi and Bryn Erickson led the way with 17 points apiece, while fellow senior Hailey Homer added 16. Hurricane is coming off a successful season last year, having made it all the way to the state 4A championship game before losing the title contest to Salem Hills. This week, the Lady Tigers play at home against Richfield on Tuesday at 5:30 p.m., followed by an away game at Payson on Friday, also at 7 p.m. Hurricane will open the regular season at home next Tuesday, Dec. 18 when they host the Desert Hills Thunder at 7 p.m. The Lady Thunder went 1-2 in their home invitational tournament to start the season, the lone win coming against Salem Hills on Dec. 1. Seniors Katelyn Philips and Rachel Myers scored 14 points apiece to lead the Lady Thunder to a 50-47 win over the SkyHawks. Desert Hills’ next scheduled contest is at Springville on Friday at 7 p.m.. The Lady Thunder’s freshmen team will be playing at Valley High in Orderville earlier that same evening. Desert Hills will open its regular season on the road next Tuesday, Dec. 18, at Hurricane at 7 p.m. The Canyon View Lady Falcons are 2-2 in preseason action, with both losses coming at home and both wins happening on the road. Following a 49-41 loss to Delta to start the season on Nov. 27, the Lady Falcons picked up a big 52-36 win at Parowan two nights later. Harlee Nicoll had a team-high 18 points and 15 rebounds for Canyon View. The following week, on Tuesday, Dec. 4, Canyon View lost at home to 2A Enterprise High, 54-44. Ashlyn Banks scored 18 for the Lady Falcons. Canyon View then bounced back with a 51-29 win at Bryce Valley in Tropic on Thursday. Banks scored 17 in that win, while guard Jordan Nielson added 14. This coming weekend, the Lady Falcons are scheduled to play two games at an invitational tournament in Richfield. Canyon View will play Millard at 4 p.m. Friday and South Sevier at 7:30 p.m. Saturday. The Lady Falcons will open the regular season at 7 p.m. Tuesday, Dec. 18, at Snow Canyon. The Lady Flyers have had a busy schedule thus far, going 4-3 in preseason action. Dixie got off to a 1-3 start, including a narrow 42-41 loss to Northridge in a game played on the Utah Jazz’s home floor in Salt Lake City. However, the Lady Flyers haven’t lost since then, winning all three of their games at the Virgin Valley Invitational tournament in Mesquite, Nevada, last weekend. On Thursday, Dec. 6, Dixie posted a 42-25 win over Shadow Ridge, Nevada. Joslyn Bundy led a balanced offensive attack with 12 points. The next day, Dixie defeated Panguitch, the defending 1A Utah state champions, by a score of 42-38. Mel Alo scored 17 to lead the way for Dixie. Then, on Saturday, Dixie outlasted Kanab 61-53, with Bundy pouring in a team-high 21 points. The Lady Flyers will open their regular season next Tuesday, Dec. 18, when they host Cedar at 7 p.m. The Snow Canyon Lady Warriors are off to a 2-3 start in the preseason. They opened with a 58-44 win at Enterprise on Nov. 27. Olivia Harris scored 26 for Snow Canyon, while Tylei Jensen added 11. The Lady Warriors then went 1-2 during the Desert Hills Holiday Classic tournament Nov. 29-Dec. 1, losing to Logan and Richfield but defeating defending 4A state champion Salem Hills. The Salem Hills game was close for three quarters, but the Lady Warriors pulled away with a 16-9 run in the fourth quarter to win 46-39. Rachel Durante scored 16 to lead Snow Canyon, while Jensen added 10. 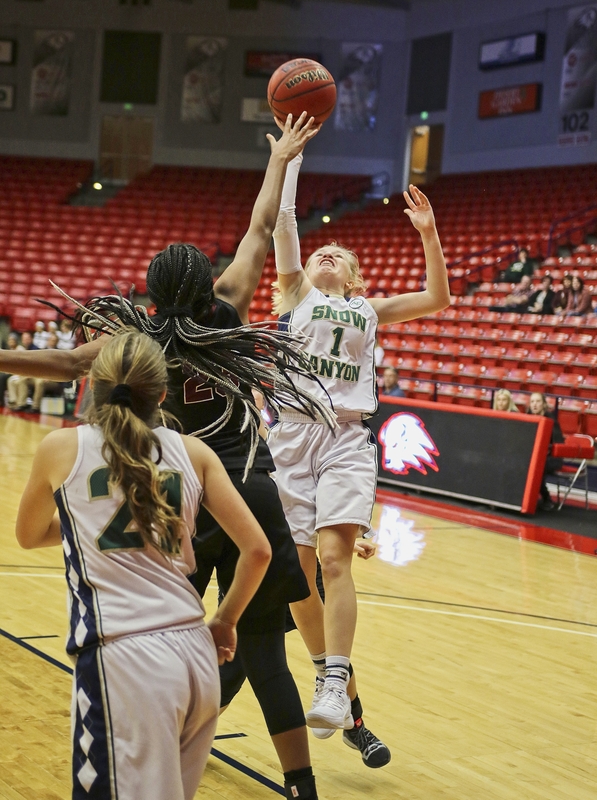 Last Friday, Dec. 7, Snow Canyon played Uintah on Dixie State University’s home floor. In that contest, the Lady Warriors started strong, leading 21-12 after one quarter. However, Snow Canyon could muster just 13 more points the rest of the game as Uintah cruised to a 47-34 victory. The Lady Utes held Snow Canyon to a single point during the fourth quarter. Jensen led the Warriors with 15 points. This coming weekend, Snow Canyon will be traveling north to play Cache County’s Green Canyon and Ridgeline high schools. The Warriors play at Green Canyon Friday at 7 p.m. and at Ridgeline on Saturday at 12:30 p.m. The Lady Warriors will then open their regular season at home when they host Canyon View on Tuesday, Dec. 18, at 7 p.m. The Pine View Lady Panthers are 1-1 thus far in preseason play, having opened with a 43-36 win over the Legacy Longhorns of Las Vegas. Sophie Jensen led the Panthers with 14 points in the game, which was played at Dixie High on Nov. 30. The next day, also at Dixie, Pine View dropped a 58-53 contest to Foothill, Nevada. Pine View led by five at the end of the third quarter, but Foothill sent the game into overtime and outscored Pine View 8-3 during the extra five-minute OT period. Ellie Wilson made 12 to lead the Panthers, while Jensen added 10. Although six of the seven Region 9 teams begin regular season play next Tuesday, Pine View has a bye and won’t play a region contest until after the holiday break, when the Panthers host Snow Canyon Thursday, Jan. 3. This week, Pine View plays at Moapa Valley, Nevada, on Tuesday. Next week, they’ll return to Nevada to play four games in the four-day Tarkanian Classic in Las Vegas Dec. 19-22.